Although interventions in childbirth are important in order to prevent neonatal and maternal morbidity and mortality, non-indicated use may cause avoidable harm. Regional variations in intervention rates, which cannot be explained by maternal characteristics, may indicate over- and underuse. The aim of this study is to explore regional variations in childbirth interventions in the Netherlands and their associations with interventions and adverse outcomes, controlled for maternal characteristics. Childbirth intervention rates were compared between twelve Dutch regions, using data from the national perinatal birth register for 2010–2013. All single childbirths from 37 weeks’ gestation onwards were included. Primary outcomes were induction and augmentation of labour, pain medication, instrumental birth, caesarean section (prelabour, intrapartum) and paediatric involvement. Secondary outcomes were adverse neonatal and maternal outcomes. Multivariable logistic regression analyses were used to adjust for maternal characteristics. Associations were expressed in Spearman’s rank correlation coefficients. Most variation was found for type of pain medication and paediatric involvement. Epidural analgesia rates varied from between 12 and 38% (nulliparous) and from between 5 and 14% (multiparous women). These rates were negatively correlated with rates of other pharmacological pain relief, which varied from between 15 and 43% (nulliparous) and from between 10 and 27% (multiparous). 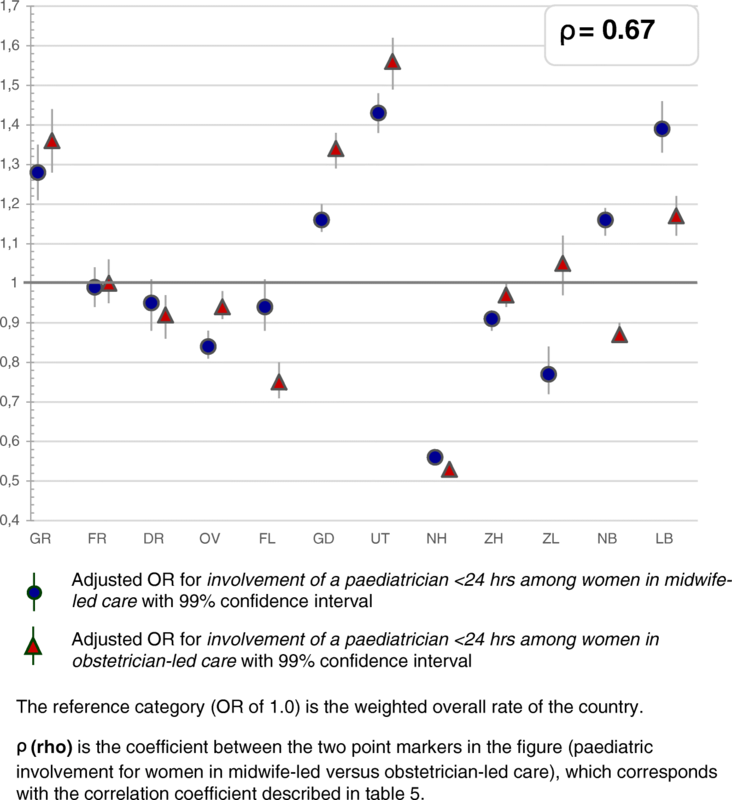 Rates of paediatric involvement varied from between 37 and 60% (nulliparous) and from between 26 and 43% (multiparous). For instrumental vaginal births, rates varied from between 16 and 19% (nulliparous) and from between 3 and 4% (multiparous). For intrapartum caesarean section, the variation was 13–15% and 5–6%, respectively. 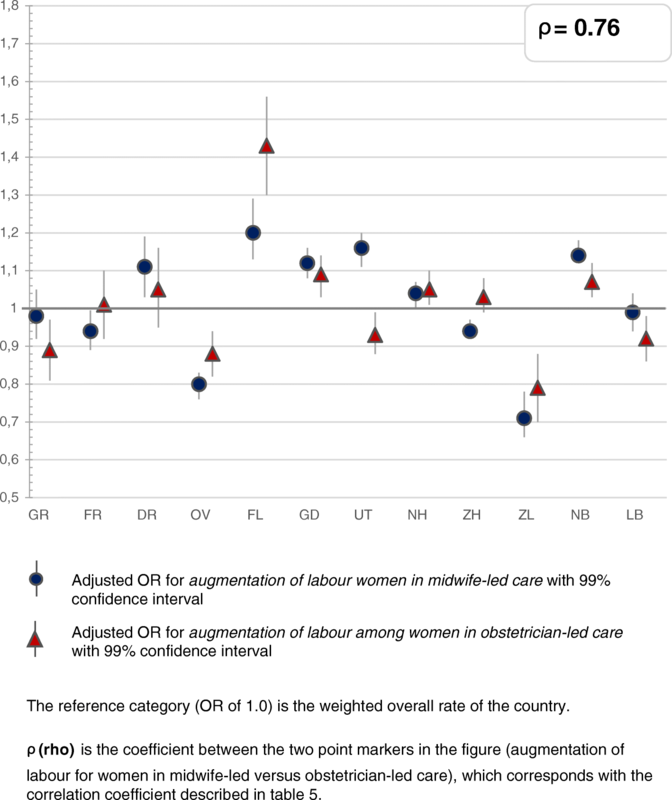 A positive correlation was found between intervention rates in midwife-led and obstetrician-led care at the onset of labour within the same region. Adverse neonatal and maternal outcomes were not lower in regions with higher intervention rates. Higher augmentation of labour rates correlated with higher rates of severe postpartum haemorrhage. Most variation was found for type of pain medication and paediatric involvement, and least for instrumental vaginal births and intrapartum caesarean sections. Care providers and policy makers should critically audit remarkable variations, since these may be unwarranted. Limited variation for some interventions may indicate consensus for their use. Further research should focus on variations in evidence-based interventions and indications for the use of interventions in childbirth. The rates of interventions in childbirth vary worldwide [1–4] and have fluctuated over the years [1, 4–7]. Induction of labour and caesarean section (CS) rates have shown a steady increase since the 1970s [1, 4, 6, 8, 9], which raised concerns . Interventions in childbirth are important in order to prevent neonatal and maternal morbidity and mortality. However, use without a medical indication may cause avoidable harm [2, 11–14]. The World Health Organization (WHO) recommends limited use of interventions during childbirth . Induction and augmentation of labour should only be performed on medical indication [16, 17]. However, there are concerns about poor adherence to this recommendation in a significant number of women with uncomplicated pregnancies [16–19]. Epidural analgesia is the most effective method for pain medication during labour , but is associated with a higher risk of instrumental birth, oxytocin use, maternal fever, urinary retention and complications, such as post-dural puncture headache [20, 21]. The decision for pain medication is ultimately based on women’s choice. There is some evidence that continuous support of labour might reduce the need for pain medication . Furthermore, the WHO states that CS rates higher than 10 % at population level are not associated with reductions in maternal, neonatal and infant mortality rates . Variations in intervention rates between high-income countries may be explained by culture and history, differences in population characteristics, maternity care systems, and national guidelines [12, 15, 24–26]. Clinical guidelines have been used for a long time to harmonise and rationalise the use of interventions within countries, and to improve outcomes [27, 28]. Nevertheless, studies comparing regions within countries like England, Ireland, Canada and Germany, have found substantial variations in rates of induction of labour, epidural analgesia, continuous fetal electronic monitoring, episiotomy, instrumental birth, and CS [29–33]. Additionally, Dutch studies have reported variations in rates between hospitals, of induction and augmentation of labour, administration of sedation and analgesics, episiotomy, instrumental birth, and CS [34, 35]. Regional variations in intervention rates, which cannot be explained by maternal characteristics, may indicate over- and underuse . This is especially true in a relatively small country without regional differences in the maternity healthcare system. The aim of this study was therefore to explore which regional variations in intervention rates in childbirth exist, and how these variations are associated both to each other, and to adverse neonatal and maternal outcomes. These are explored for single childbirths from 37 weeks of gestation onwards in midwife- or obstetrician-led care in the Netherlands, and controlled for maternal characteristics. For this nationwide study, we used consolidated data of the years 2010 to 2013 from Perined, the national perinatal register that includes data from almost all births in the Netherlands. Perined aims to improve the quality of perinatal care through providing data for research and audits on adverse outcomes. The Perined register includes data from: primary midwife-led care (the national perinatal database 1); secondary obstetrician-led care (the national perinatal database 2); paediatric care (the national neonatal register); and primary midwifery care by general practitioners (the national perinatal database h). The data are routinely recorded by the care providers and combined into the Perined register via a validated linkage method [37, 38]. More than 98% of all midwifery practices and obstetric hospital units record their births in this combined database . All single childbirths from 37 weeks’ gestation onwards were included. Exclusion criteria were missing data on: postal code; parity; or from the national perinatal database 1, covering midwife-led care, but where the woman was referred to obstetrician-led care, covered by the national database 2. In the Netherlands, low-risk women in primary midwife-led care are cared for by independent midwives who attend home births, low-risk hospital births, and births in alongside and free-standing birth centres. The Dutch Birth Centre Study showed that health outcomes, experiences, and costs for low-risk women are similar for planned birth in a birth centre and planned birth in a hospital, both supervised by a primary care midwife [40, 41]. When risks for adverse outcomes increase or complications arise, women are referred to obstetrician-led care. Interventions in childbirth such as induction and augmentation of labour, pain medication, instrumental birth, and CS, are only available in an obstetrician-led care setting [42, 43]. Intrapartum interventions may be used for women in midwife-led care at the onset of labour after referral to obstetrician-led care. Therefore, intervention rates are not comparable for women who are in midwife-led care and women who are in obstetrician-led care at the onset of labour. The VU University Medical Center confirmed that ethical approval was not required for this study according to the Dutch legislation (reference WC2016–055; http://www.ccmo.nl/en/your-research-does-it-fall-under-the-wmo). Births were attributed to one of the twelve Dutch administrative provinces (further referred to as ‘regions’) according to the residential postal code of the mother. All low-risk women have access to all types of birth settings, but not all types are present in all regions . We adjusted for this by using the residential postal code of the mother. The following interventions were examined as the primary outcomes: induction of labour; augmentation after a spontaneous onset of labour; intrapartum oxytocin use; epidural analgesia; other pharmacological pain relief; instrumental vaginal birth; CS (prelabour, intrapartum); and involvement of a paediatrician in the first 24 h after birth. Births from 42 weeks onwards were not excluded, because they may explain variation in particularly induction of labour rates, and they may reflect different policies between regions. Artificial rupture of membranes before a spontaneous onset of labour was defined as induction of labour, and administration of oxytocin to stimulate uterine contractions after spontaneously ruptured membranes as augmentation. A CS after spontaneously ruptured membranes was defined as intrapartum CS. Intrapartum oxytocin includes the use of oxytocin for induction or for augmentation of labour, but not oxytocin use in the third stage of labour. Women with a prelabour CS were excluded from the analyses on pain medication. Women with an intrapartum CS and an epidural, are classified as epidural analgesia for labour pain, since epidural analgesia is generally not used for caesarean sections without prior epidural analgesia for labour pain. In Perined ‘other pharmacological pain relief’ is specified as: sedatives; non-opioid analgesics; and opioid analgesics without further details. The most common opioid analgesics are pethidine injections, sometimes combined with a sedative such as promethazine, and patient-controlled remifentanil . In some births, epidural analgesia and other pharmacological methods for pain medication were both used, and therefore, the percentages could not be added up . The secondary neonatal and maternal outcomes were: antepartum and intrapartum stillbirth; neonatal mortality; Apgar score below 7 at 5 min; third or fourth degree perineal tear among vaginal births; and postpartum haemorrhage (PPH) of 1000 ml or more. Antepartum stillbirths with births beyond 37 weeks were included, since this may influence intervention rates. Neonatal mortality was defined as neonatal death up to 7 days. Antepartum and intrapartum stillbirths were excluded from the analyses on Apgar score. Women who gave birth by CS were excluded from the analyses on third or fourth degree perineal tear. The following maternal and neonatal characteristics were included as independent variables or potential confounders [29, 30, 32, 46–49]: parity (nulliparous, multiparous); care setting at the onset of labour (midwife-led, obstetrician-led), maternal age (< 20, 20–24, 25–29, 30–34, 35–39, ≥40 years); ethnic background (Dutch, non-Dutch); degree of urbanisation (urban, intermediate, rural); socioeconomic status (high, medium, low); gestational age (37 + 0–37 + 6, 38 + 0–40 + 6, 41 + 0–41 + 6, ≥42 weeks); and birth weight (< 2.3rd, <10th, >90th, > 97.7th percentile). Ethnic background was reported by the care provider and was defined as Dutch or non-Dutch, because of inconsistencies in recording non-Dutch subgroups. The degree of urbanisation was based on the four digits of the residential postal code of the mother. For 2500 or more addresses/km2, the degree of urbanisation was categorized as urban, and for less than 500 addresses/km2 as rural. Socioeconomic status [SES] was based on a proxy measure indicated by the Netherlands Institute for Social Research (SCP), which includes education, employment, and level of income of the residential postal code area (Statistics Netherlands; https://bronnen.zorggegevens.nl/Bron?naam=Sociaal-Economische-Status-per-postcodegebied). SES was classified as high, medium and low, based on the 25 and 75 percentile cut-off points. The baseline characteristics were described in percentages per region. The variation in interventions was analysed overall, and in subgroups according to the care setting. Stratification by parity was applied for the crude rates. Univariable analyses were performed to gain insight in the variations of intervention rates and childbirth outcomes in the twelve regions. All interventions and childbirth outcomes mentioned above were included in the univariable analyses. The percentages of missing data were low, namely from between 0.0 to 2.5% for baseline characteristics, from between 0.0 to 0.8% for interventions, from between 0.0 to 0.1% for neonatal outcomes, and from between 1.4 to 2.7% for maternal outcomes. Therefore, cases with missing data were excluded. Multivariable logistic regression analyses were conducted for all births and stratified by the care setting, with adjustments for: parity; maternal age; ethnic background; socioeconomic position; and the degree of urbanisation. The results of the multivariable analyses were illustrated in figures with maps and boxplots with adjusted odds ratios (ORs) and 99% confidence intervals (CIs). The weighted overall intervention rate was taken as the reference. This weighted rate was the overall intervention rate, with the intervention rate of the region weighted for the number of women in each region. A confidence interval of 99% was chosen to limits chance findings due to multiple testing in a large dataset. Outcome variables were dichotomised and dummy variables were created to account for potential confounders in the multivariable logistic regression analyses. An important topic of this study, was to explore whether the variation of one intervention was associated with the variation of another intervention. Instead of exploring associations with eyeballing only, we quantified these associations by calculating Spearman’s rank correlation coefficients. These were calculated to demonstrate the associations of regional adjusted ORs between interventions in different care settings, and between interventions and childbirth outcomes. Correlation coefficients were calculated for the adjusted ORs of the regions, but only for outcomes that varied significantly between the regions. Since the sample size for all calculated correlations was the same, namely 12 regions, all correlations with ρ ≥ 0.57 or ≤ − 0.57 corresponded with a p-value of 0.05. Although the limits for clinically significant correlations are arbitrary, we considered a correlation of ρ ≥ 0.60 or ≤ − 0.60 as strong , and only these correlations were discussed in the text and indicated in bold in the tables. Statistical analyses were performed using SPSS Statistics 22 (SPSS Inc., Chicago, IL, USA). First, overall results and remarkable associations between subgroups of women or between interventions were described. Second, results for each intervention were described, starting with those that showed most variation. Figure 1 shows the number of births eligible for inclusion in this study and Table 1 describes the maternal and neonatal characteristics. 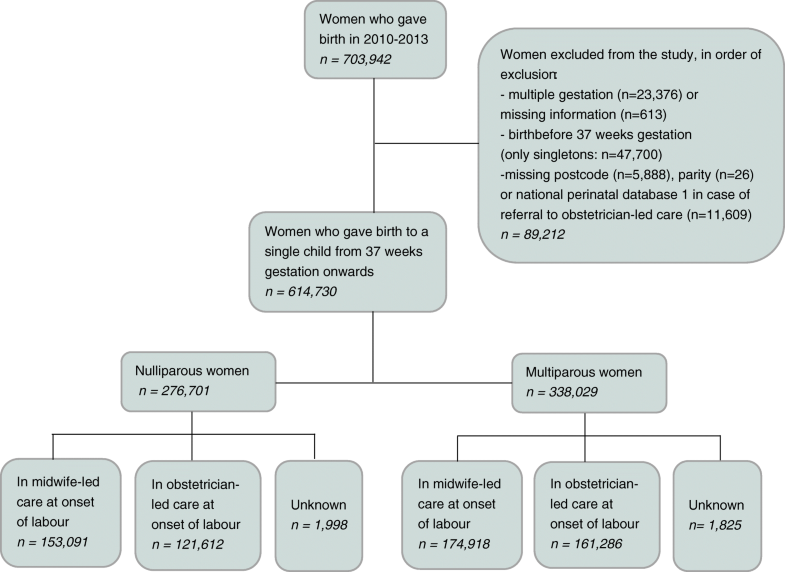 Of the 276,701 births in nulliparous women, 153,091 were in midwife-led care at the onset of labour, 121,612 in obstetrician-led care, and for the remainder, the care setting was unknown. For births in multiparous women, these numbers were 174,918 and 161,286 respectively. In the regions, the proportion of mothers younger than 20 years of age ranged from between 0.8 to 2.2%, and of 40 years or older from between 2.4 to 4.5%. The lowest proportion of mothers with a non-Dutch ethnicity was 9.3% and the highest 34.6%. In three regions, there were no urban areas, whereas in all regions there were mothers living in rural areas, with a range of between 11.1 and 48.5%. Proportions of mothers with a low socioeconomic status varied from between 24.1 to 59.2%. Regions with the lowest number of births after 42 weeks (varying from between 0.8 to 2.5%), had higher numbers of births at 37–38 weeks (varying from between 5.8 to 9.2%), and vice versa. We found a similar pattern for birth weight below the 2.3rd, 10th or above the 90th or 97.7th percentile, with rates varying from between 1.4 to 2.1% for birth weight below the 2.3rd percentile, and from between 2.3 to 3.5% for birth weight above the 97.7th. The greatest variation was found for the type of pain medication and whether a paediatrician was involved within 24 h after birth, followed by variation in augmentation after a spontaneous onset of labour. Less variation was found for induction of labour and prelabour CSs, and least for instrumental vaginal births and intrapartum CSs (Figs. 2, 3, 4, 5, 6 and 7). Similar variation in intervention rates was found for births in midwife-led care compared to those in obstetrician-led care at the onset of labour in the same region (Additional file 1: Table S5). The adverse neonatal and maternal outcomes were not lower in regions with higher intervention rates (Additional file 1: Table S8). Table 2 describes the intervention rates by region in subgroups stratified by parity, and Additional file 2: Table S4 the crude and adjusted ORs with confidence intervals, on which Figs. 2, 3, 4, 5, 6 and 7 are based. Most variation was found for the type of pain medication during labour (Fig. 2a and b), with epidural analgesia rates varying from between 12.3 to 37.5% in nulliparous and from between 4.6 to 13.8% in multiparous women, and rates of other pharmacological pain relief varying from between 14.8 to 43.0% in nulliparous and from between 9.8 to 26.8% in multiparous women without prelabour CS (Table 2). The variation of pain medication was similar for women in midwife-led compared to those in obstetrician-led care within the same region, with ρ = 0.97 (Additional file 1: Table S5), but rates were lower for women in midwife-led care. Generally, lower rates of other pharmacological pain relief were found in regions with higher rates of epidural analgesia, and vice versa. The correlation coefficient was ρ = − 0.61 for women in midwife-led care and ρ = − 0.68 in obstetrician-led care (Additional file 1: Table S6). There were no significant correlations between the use of pain medication and augmentation of labour, intrapartum oxytocin use, instrumental vaginal birth, intrapartum CS, or spontaneous vaginal birth (Additional file 1: Table S7). As can be seen from Fig. 3, considerable variation was found for the involvement of a paediatrician in the first 24 h after birth, with rates varying from between 36.9 to 60.3% for nulliparous and from between 25.6 to 42.7% for multiparous women (Table 2). Figure 4 shows maps with variations of spontaneous birth rates, CS rates, and rates of intrapartum oxytocin between regions. Rates of intrapartum oxytocin, used for induction or augmentation of labour, were found of between 55.1 and 66.5% for nulliparous and of between 39.7 and 51.7% for multiparous women (Table 2), and varied significantly across regions (Fig. 4c). Rates of augmentation after a spontaneous onset of labour varied across regions from between 33.5 to 48.4% for nulliparous and from between 12.4 to 22.6% for multiparous women (Table 2). Instrumental vaginal birth rates were lower (ρ = − 0.61) and spontaneous vaginal birth rates were higher (ρ = 0.66; Additional file 1: Table S7) in regions where rates of augmentation of labour were higher. Variations in augmentation of labour are shown in Fig. 5. Less variation was found for induction of labour, instrumental vaginal birth, and prelabour and intrapartum CS. Rates of prelabour CS were found of between 3.6 and 5.8% for all nulliparous and of between 5.8 and 9.8% for all multiparous women, and induction of labour rates of between 18.0 and 26.2% for all nulliparous and of between 16.6 and 25.4% for all multiparous women (Table 2). Figure 6 illustrates the ORs of prelabour CS and induction of labour. Regions with higher rates of prelabour CS had higher rates of intrapartum CS as well (ρ = 0.67), and lower rates of spontaneous vaginal births (ρ = − 0.62; Additional file 1: Table S7). Compared to the other interventions, least variation was found for intrapartum CS and instrumental vaginal birth for women without prelabour CS (Fig. 7a and b). Intrapartum CS rates varied from between 12.7 to 15.4% (nulliparous women) and from between 5.3 to 6.4% (multiparous women), and instrumental birth rates varied from between 16.2 to 19.4% (nulliparous women) and from between 3.1 to 4.2% (multiparous women) (Table 2). For midwife-led care, regions with higher intrapartum CS rates had higher instrumental birth rates as well (ρ = 0.60), but this correlation was not significant in obstetrician-led care at the onset labour (ρ = 0.45; Additional file 1: Table S6). For all nulliparous women, a variation of spontaneous vaginal birth rates was found of between 62.4 and 67.4%, and for multiparous women, of between 81.7 and 86.1% (Table 2). The results of the multivariable analyses for the childbirth outcomes are described in Table 3. The overall incidence of antepartum and intrapartum stillbirth was 0.12% and of neonatal mortality up to 7 days 0.08%, but the adjusted ORs did not vary significantly between regions (Table 3; not shown in figures). Correlation coefficients were therefore not calculated for these outcomes. The incidence of Apgar score below 7 at 5 min varied significantly across regions from between 0.7 to 1.5%. For third and fourth degree perineal tear, incidences varied from between 1.8 to 3.2% and for PPH from between 3.7 to 6.9%. The only intervention and adverse outcome that were significantly correlated, were augmentation of labour after a spontaneous onset of labour and PPH (ρ = 0.87; Additional file 1: Table S8). In this nationwide study, most interregional variation was found for the different types of pain medication (epidural analgesia or other pharmacological pain relief), and for the involvement of a paediatrician in the first 24 h after birth. Less variation was found for prelabour CS, augmentation and induction of labour, and least for instrumental vaginal birth and intrapartum CS rates. Regions with higher rates of one intervention did not have higher rates of all other interventions. Interventions that were correlated, were epidural analgesia and other pharmacological pain relief (negatively), augmentation of labour and instrumental vaginal birth (negatively), intrapartum CS and prelabour CS (positively), and for women in midwife-led care at the onset of labour, intrapartum CS and instrumental vaginal birth (positively). Regional variation was similar for women in midwife-led compared to those in obstetrician-led care within the same region. PPH occurred more often in regions where rates of augmentation of labour were higher. Antepartum and neonatal mortality rates did not vary significantly. Regions with higher intervention rates did not have lower rates of adverse neonatal and maternal outcomes, or vice versa. This study is based on routinely collected data. Reporting bias is an issue in any register dataset, particularly for subjective outcomes, such as Apgar score and blood loss. Pitfalls in the use of these register-based data are described in a recent article of De Jonge et al. . Misclassification is expected to be similar across regions and it is unlikely that it accounts for any of the variations. Another limitation is the absence or incompleteness of some variables in the dataset, such as maternal body mass index, congenital disorders, and obstetric history of low birth weight or previous CS. However, it is unlikely that this explains all variations observed, because adjustments for maternal characteristics did not lead to considerable changes in regional variation. Besides, it does not explain the large variation in pain medication and involvement of a paediatrician. On the other hand, regional variations in subgroups of different ethnic backgrounds could explain some of the variations. Secondly, regions with higher rates of referrals from midwife-led to obstetrician-led care, may have more low- or medium-risk women in obstetrician-led care, which might be reflected by lower intervention rates in obstetrician-led care, and higher rates in midwife-led care. However, our results showed strong positive correlations between intervention rates in midwife-led and obstetrician-led care within the same region. Last, by calculating correlation coefficients between regional adjusted ORs, it was not possible to account for the confidence intervals of the ORs. Therefore, these calculated correlations are only a rough indicator of relevant and significant correlations between variables. Besides, in case of minor variation in ORs, a Spearman’s rank correlation coefficient readily becomes insignificant, since it is based on ranking of the twelve regions. The Spearman’s rank correlation coefficients should be interpreted with caution, also because of multiple testing. To our knowledge, this is the first study investigating regional variations of multiple interventions in childbirth in the Netherlands. A major strength of this study is its inclusion of almost all births in the Netherlands between 2010 and 2013. As stated in a Lancet series on Midwifery, available data strongly suggest an urgent need for more research to assess the appropriate use of interventions in childbirth . This study contributes to this need. Because the results were described separately for women in midwife- and obstetrician-led care at the onset labour, it has become clearer in which subgroups variations in interventions are more prevalent. 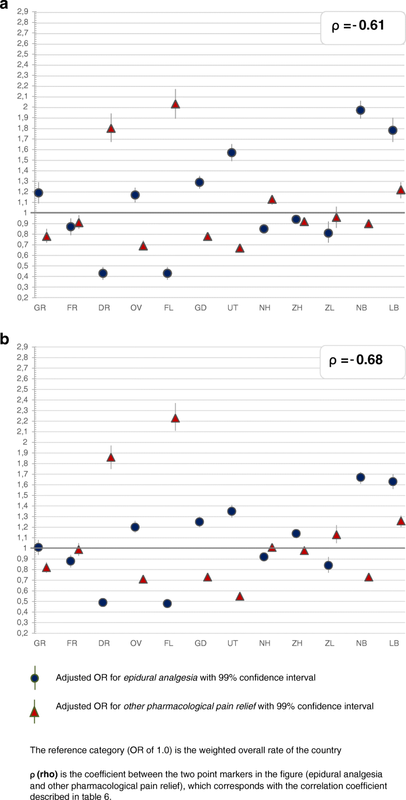 Another strength of this explorative study is the comparison of groups of births based on the mothers’ residential postal codes rather than her place of birth. Presence of a tertiary academic hospital in a region has had limited impact on results in this way, since in all regions both low- and high risk women are represented, women have access to all types of birth settings, while not all types are present in all regions, and confounders are more equally distributed than between hospitals . However, other confounders, such as distance to a hospital, may still have influenced the outcomes. Multilevel analyses were not performed, since the aim of this study was to explore regional variations that are not explained by maternal characteristics but may be explained by variations between care professionals and/or care settings (midwifery practices, hospitals). 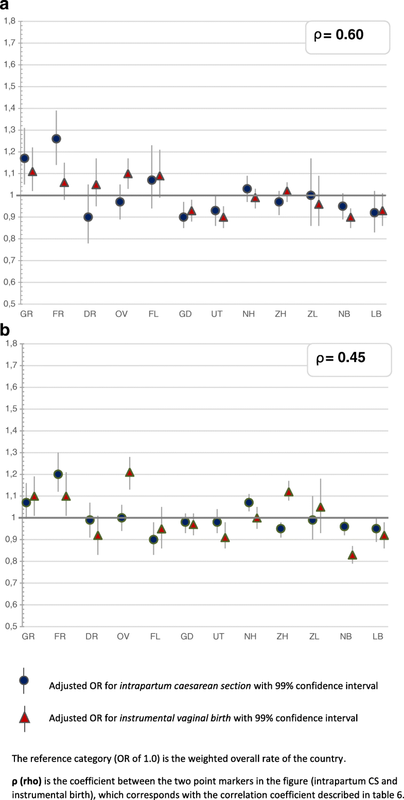 The results from previous studies on regional variations in perinatal mortality and PPH in the Netherlands were not completely consistent with our results, probably due to older data and different samples [49, 51]. It is not possible to establish causal relationship in our study, for instance between augmentation of labour and severe PPH. However, the results are consistent with findings from previous studies that showed an association between oxytocin use during labour and severe PPH [52, 53]. Other studies showed greater variations between regions within a country than our study [29, 31–33, 54, 55]. Although variation in for instance augmentation of labour appears limited, an additional 10,300 nulliparous women would receive oxytocin for augmentation each year if the highest regional rate would become the national rate, compared to the lowest rate. Even in case of limited variation in intervention rates, crude numbers show that variation might nonetheless be unwarranted. An aim of evidence-based practice is to minimize unwarranted variation in the use of interventions [56, 57]. However, it is still unknown what would be the best rate for augmentation of labour and for other interventions. Regions with higher rates of augmentation of labour had on one hand higher rates of PPH, but on the other hand lower instrumental vaginal birth rates. Whether there is a causal relationship between these variables, needs to be investigated in further research. Generally, the optimal rate is the lowest rate with comparable neonatal and maternal outcomes. In our study adverse neonatal and maternal outcomes were not lower in regions with higher intervention rates. However, achieving a low intervention rate should not be an aim in itself [10, 57]. It is not possible to identify the optimal rate of interventions based on this study. An essential element in improving quality of care, is that care providers critically audit remarkably high and low rates [10, 58]. This study intends to contribute to this debate. Following national guidelines and using the recommendations of the WHO might help in achieving the optimal use of interventions [15–17, 23, 58]. On the other hand, differences in regional guidelines and in adherence to national guidelines may explain a part of the large variation in type of pain medication and involvement of a paediatrician. Use of epidural analgesia for women with a single fetus in cephalic position after 37 weeks’ gestation, has almost tripled between 2000 and 2009 in the Netherlands (from 7.7 to 21.9%) . In 2008, a multidisciplinary guideline on pain medication was published, in which adequate pain relief upon request for all women during labour was advised, with epidural analgesia as the most effective method for pain relief. Two randomized controlled trials showed that women were more satisfied with epidural analgesia compared to patient-controlled remifentanil [60, 61], but access to pain medication should not be at the expense of continuous support, which can reduce the need for pain medication . The large variation in rates of pain medication suggests different degrees of implementation of evidence and national guidelines, leading to disparity in accessibility to pain medication. Furthermore, the absence of a national guideline on when a paediatrician needs to be involved after birth and differences in accessibility may explain a part of the large variation in the rates of paediatric involvement, leading to differences in care and costs. Further research is required to examine which medical and non-medical factors may explain the large variations in pain medication and involvement of a paediatrician. Clinical practice is influenced by characteristics of the care provider, such as age, educational background, perceptions of risks, and views on childbirth [62–66]. Culture within the work environment may encourage care providers to take similar decisions, and variations are therefore not merely individual . Differences in perceptions and attitudes may result in differences in local practice and guidelines. The fact that variations were found between regions, even after adjustments for maternal characteristics, suggests that there may be cultural differences between regions, reflected in differences in the views of care providers on childbirth [63, 68, 69]. The large variation, in particular for pain medication and involvement of a paediatrician, cannot be explained by clinical variations only. Similarities in variations in interventions that were found between women in midwife-led and obstetrician-led care, suggest similar practice by midwives and obstetricians within regions. These similarities existed in interventions with minor variation as well as in those with considerable variation. The results of this study call for implementation of evidence-based interventions, and for investigation into indications for the use of interventions in childbirth . The Robson Classification System could be used to explore subgroups of women that account for the greatest variation . Limited variation in some of the interventions in our study may indicate consensus about its use. However, variations may be greater between midwifery practices, hospitals, collaborations or care providers, than between regions where variations between organisations and practitioners will have been averaged. In further research, variations within the regions should therefore be investigated. The greatest variation was found for the type of pain medication and the involvement of a paediatrician, and the least for instrumental vaginal birth and intrapartum CS rates. The rates of adverse outcomes were not lower in regions with higher intervention rates. Care providers should critically audit remarkable variations, since these may be unwarranted. Variation may be explained to some extent by a difference in the degree of implementation of national guidelines between regions. Further research should therefore focus on variations in evidence-based interventions and indications for the use of interventions in childbirth. We thank Perined for the use of the national database and Janneke Wilschut for giving advice on the statistics. This study was funded by AVAG, Amsterdam Public Health Research Institute, VU University Medical Center. There was no external funding for this study. The data that support the findings of this study are available from Perined, but restrictions apply to the availability of these data, which were used under license for the current study, and so are not publicly available. Data are however available from the authors upon reasonable request and with permission of Perined. AESS and AdJ conceived the study and AESS wrote the paper. AESS, DCZ and CG conducted the analyses. AE, DCZ, MN, TvdA, CV, CG, FS and AdJ contributed to the methods of the study and the interpretation of the findings, and revised earlier drafts of the article. All authors read and approved the final manuscript. The VU University Medical Center confirmed that ethical approval was not required for this study, according to the Dutch legislation (reference WC2016–055; http://www.ccmo.nl/en/your-research-does-it-fall-under-the-wmo). EURO-PERISTAT Project with SCPE and EUROCAT. European Perinatal Health Report. Health and care of pregnant women and babies in Europe in 2010. EURO-PERISTAT; 2013. https://www.europeristat.com. The BMJ. 11. Correlation and regression. http://www.bmj.com/about-bmj/resources-readers/publications/statistics-square-one/11-correlation-and-regression. Accessed 11 Jan 2018. Wennberg JE, Fisher ES, Skinner JS. Geography and the debate over Medicare reform. Health Aff (Millwood) 2002, Suppl Web Exclusives: W96–114. https://doi.org/10.1377/hlthaff.w2.9.